The garden hose is a tool that every home owner should have regardless of whether or not they own a garden. While the name seems to imply that this kind of hose is for use in a garden or in watering flowers or plants, the classic garden hose can be used for much more and every home should have one. There are several varieties of garden hoses to choose from and not all garden hoses are created equal. Most garden hoses have some basic characteristics in common, but there are also differences between the different kinds that make them better suited to different tasks around the home. This post will discuss some of the common characteristics as well as some of those differences and the many uses of the garden hose. In addition, we will discuss some of the accessories and garden hose related products that you can buy to make using the garden hose easier and more effective. 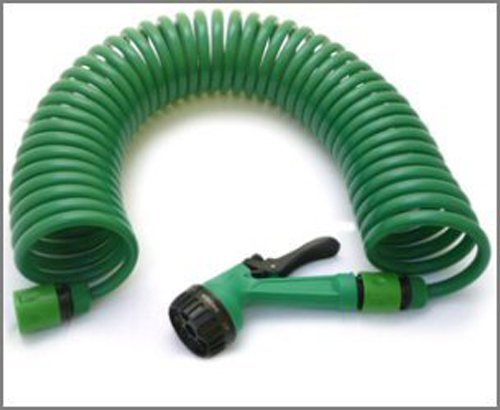 We will start out with a sampling of some of the most popular garden hoses on the market. First, a garden hose should have one female and one male threaded coupling at the two ends. The female coupling is generally used to connect to your water source and you will find that this coupling has a free range of movement so that you can turn the coupling to tighten it without turning the entire garden hose. The male coupling is where you attach your garden hose attachments or nozzles and generally the garden hose nozzles turn to tighten. There are many different kinds of nozzles and attachments for garden hoses to choose from depending on the job you want to get done. Another similarity for all garden hoses is that they roll up for storage. Variations from hose to hose make some easier than others to roll up, but all garden hoses should be rolled up to store them properly. In addition to the attachments you can buy for a garden hose, there are several different garden hose storage devices that you can purchase as well. Some garden hoses are made of nylon or other plastic compounds while others are made of rubber. The main motivation behind rubber garden hoses is that they coil easier than plastic ones and they are less likely to kink. On the other hand, rubber hoses are generally much more expensive than nylon or other plastic garden hoses. Sometimes you might pay twice as much for a garden hose made of rubber. Plastic garden hoses are more durable than rubber ones and are less likely to get pierced or permanently crimped. Another possible difference between garden hoses might be the shape of the hose. Some garden hoses are just tubes that have a rigid construction while others are tubes that will flatten when they are not in use. The flat garden hose is a plus because it allows for easier rolling and storage. It not only takes up less room when it is rolled, but you are less likely to have excess water in the garden hose after you are done using it. Another garden hose shape is the coil garden hose which looks like a large spring. 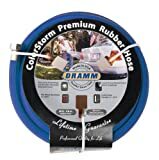 The coil is usually not very big when it is being stored and in its compact form, but the garden hose length is actually anywhere from twenty five to fifty feet. A fifty foot hose can be as small as thirty four inches long when in its compact form. One interesting garden hose variation is the heated garden hose. Heated garden hoses are necessary if you need to use your hose in freezing temperatures. Most hoses have an at least six foot power cord that you can plug into any standard outlet and the heating element usually has an automatic on and shutoff feature. One such heated garden hose will turn on when the temperature inside the hose reaches less than 45 degrees and turns off again when the temperature is above 57 degrees. You would only need this type of garden hose if you needed to leave the hose full of water when the temperatures are supposed to be below freezing or if it were so cold that even running water would freeze without outside intervention. On the other hand, you might need a heated garden hose if you need hot water to complete a task. For example, if you are trying to take off old shingles instead of having a roofing service do it, you might need a high pressure stream of hot water to help loosen the tar under the asphalt shingles. 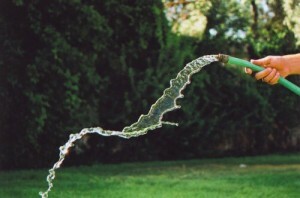 A sprinkler garden hose has small holes along the length of the hose so that when it is turned on, the water comes out of several places rather than just at the garden hose nozzle. Some garden sprinkler hoses have small holes and others have small slits. You can face the openings upward to provide sprinkling capabilities or downward if you want to soak an area of the ground. Sprinkler hoses are an interesting variation on a garden hose, but be careful not to get it mixed up with your other garden hose because you could end up getting very wet. Even though the name might be misleading, watering plants or flowers is only one of the uses for your garden hose. It is an essential tool in many outdoor maintenance projects for every home owner. Some of the tasks for your garden hose might require a special nozzle or attachment, but the few extra dollars you will spend on those attachments could save you hours of time if not more money because you do not have to rent special equipment. Gutter cleaning can be a messy and tedious job if you clean the gutters by hand and scoop out all of the debris with your hands or a gutter scoop. However, if you use a pressurized water stream, you could push any debris or clogs out of the gutter system easily. You can rent a power washer for this task, or you could buy a gutter wand attachment for the garden hose. Instead of climbing up and down a ladder and moving it every three to four feet, you can spray your gutters clean from ground level. Speaking of power washers, your garden hose can provide the water stream to your power washer when you need it to clean a deck or the siding on your house. It would be extremely rare for you to be able to reach all the areas you need to reach with your power washer if you had to keep the machine right next to a water source at all times. The garden hose allows you to move your power washer up to fifty feet away from the water source and still have adequate pressure to operate. Another use for your garden hose can be summer fun for your children. You can hook the garden hose up to a sprinkler or water slide for hours of summer time enjoyment. The only problem with this type of use for your garden hose is that there is usually nowhere for the water to go and pools of water tend to form on your yard and end up killing the grass. 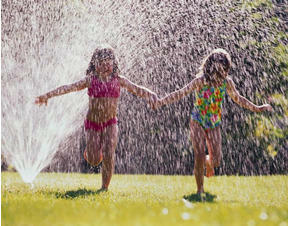 It would be best if you recycled the water you use in sprinklers or a water slide to a storm drain or irrigation system. Sprinkler systems are not just for fun and games. Many homeowners use a sprinkler to water plants or the grass in their lawns. You can either use the sprinkler manually and turn on the water every time you want to water things or you can use a timer. Timers are attached at the water source and they allow water to flow through the sprinkler system at certain times for certain lengths of times. Some homeowners choose to use garden hoses as permanent extension cords that move the location of an outdoor spigot. If you have a spigot in one location but you want one in another, you can run garden hose from the original water outlet to your new location and bury the hose so that it is not noticeable. Alterntively, you could create and outdoor spigot where non existed. You could run a garden hose from a water source inside your garage or basement out through an access hole or under a door so that you ahve permanent water sourcing outdoors. Finally, garden hoses can be useful after you are done using them. Garden hose scraps have many uses around the yard or house. For example, some tool owners use cut pieces of garden hose to cover the blades on saws when they are being stored. Slit pieces of garden hose can cover swing set chains so that little fingers do not get caught in the chain pieces. 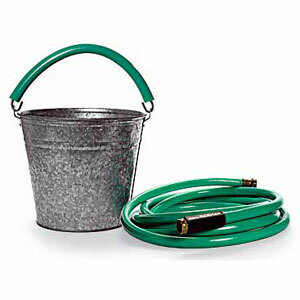 Alternatively you could put a piece of garden hose over a wire bucket handle for a better grip that does not dig into your hand. There are many types of nozzles and attachments for garden hoses to choose from. Which garden hose nozzle you choose depends on what you want to do with your outdoor hose. Most nozzles screw in and have a handle that you depress when you want water to flow. The end of the garden hose nozzle will be circular. Some of these circular nozzles have only one setting and the water comes out in a shower or a concentrated stream. Other garden hose nozzles have several settings and you can get anything from a high pressure stream to a shower to a flat stream out of the same garden hose head. Other garden hose heads are straight pieces that you turn on and off with a twist. These nozzles will generally only have one type of stream, but the pressure behind the stream can be adjusted by turning the nozzle more. The disadvantage of this kind of a control device for your garden hose is that they take much longer to turn off than the handle varieties since all you have to do with a handle is let it go and you are much more likely to get your work gloves wet with the twist nozzle. There are some additional garden hose attachments you might consider. First, there are what people call quick disconnects. These fittings are designed to allow you to disconnect a hose from a nozzle or from a spigot quickly without having to turn the threads. The quick disconnects for garden hoses screw onto the regular garden hose fittings but attach to the nozzle and spigot quickly with a push and a twist. Another important garden hose attachment is a sprinkler attachment. You can attach sprinkler systems to the end of your garden hose and then the sprinkler is portable and can be used in several different areas of the yard. These attachments are good for communities that limit water usage so that you can water every part of your lawn but only water one part at a time using as little water as possible. Another use for sprinkler attachments is fun for your kids. Setting up a sprinkler on a hot summer day is a great way to keep your kids occupied for hours. We briefly discussed the gutter wand earlier, but this is another handy garden hose attachment. A long telescoping wand that attaches to your garden hose can reach your gutter system from the ground. At the end of the wand there is usually an adjustable nozzle so that you can adjust both the direction and shape of the high pressure water stream. You can also use this garden hose system to clean off the solar collecting panels of your solar lights on the roof. Since you definitely need a garden hose around the house, you have to find a neat way to store the garden hose when it is not in use. A messy pile of hose will not only look bad, it will also leave dead spots in your grass where the hose covers up the grass an prevents sunlight. In addition, an unsecured garden hose can be a tripping hazard. There are many different choices when it comes to garden hose storage, and the type of storage you pick depends on how often you will use your hose and how long it is. The first and least expensive type of garden hose storage is a garden hose hanger. Garden hose hangers are installed on the side of your house or shed. The garden hose hanging device is attached to the house with screws or nails. There is usually a bar that extends out from the house in the center where the hose hangs, and then there is a decorative front to hide the hose from view. The proper way to store a garden hose on a garden hose hanger is to roll the hose up first and then place the hose on the hanger. It is more difficult to put the hose on the hanger as you roll it because you are more likely to get kinks. Because you have to curl the hose up yourself, it is better to use this type of garden hose storage for shorter hoses. Another type of garden hose storage is a garden hose stand. The stands usually have a tripod base for stability and a half circle shaped stand with high sides where a rolled up garden hose can hang. A good advantage to this type of garden hose storage is that you can move the garden hose stand wherever you like. Another option is a garden hose storage basket or garden hose pot. These garden hose containers can accommodate a rolled hose in them and are quite decorative. It may be difficult to get the hose to roll up small enough so that the circumference of your rolled hose is smaller than that of the basket or pot; however, they hide the hose quite well and can be considered decorative items in your landscaping or garden decorations. 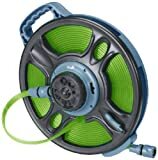 The final type of garden hose storage is a garden hose reel or retractable garden hose. These garden hose storage devices come in many shapes and sizes. Some are covered and some are in the open. Some have handles that you crank to retract the hose and others have automatic retraction powered by a motor. The garden hose reels that are not hideaways have a cylindrical center that the hose wraps around as you turn a handle apt the end. These garden hose storage reels are usually placed next to your outdoor spigot so that the hose can remain attached to the water source while stored on the reel. The retractable garden hose storage units that are hideaways look like large plastic boxes. There is either a handle on the outside to turn the shaft, or a switch that activates a motor. You can usually access the stored garden hose through a door in the top of the garden hose hideaway. These garden hose storage units are better for longer hoses that might be difficult to roll up on your own. In addition, they are great for flat garden hoses that need constant pressure to make sure they are stored flat. 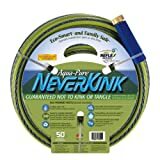 The only negative with retractable garden hose storage is that you can get permanent kinks in the hose if they are rolled up with a bend in them. Because the hose is hidden from your view, you may not notice the bed or kink until the next time you unroll the hose.